Throughout the years, warehouse storage has evolved tremendously. 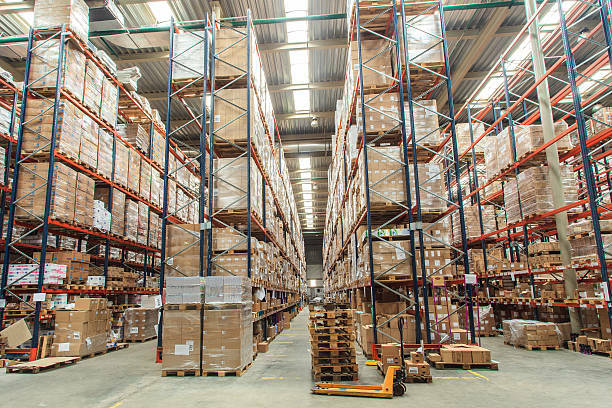 From simplified shelves to tall steel storage solutions, there have been many types of racks to fill the space in warehouses to house all of the products and merchandise. However, the latest warehouse racks are proving to be much more efficient for warehouse business owners. If it has been a while since you have made updates to your warehouse racks, there is no time like the present to consider making some changes. Take a look at how warehouse racks from Benco Industrial can improve the productivity in your place of business. See improved productivity thanks to maximized space. Help your productivity numbers hit a sharp rise, by giving your employees more space to work with for storage within the warehouse with new and upgraded racking systems. Modern warehouse racks take advantage of all vertical space available while keeping the floor space used at a minimum. This gives your employees more room to maneuver with handling equipment, such as forklifts, rolling bins, and pallet jacks so they do not spend extra time transporting products and struggling to get around the building. Likewise, with more storage space, it is easier to categorize and arrange products and merchandise to streamline the process of storing and retrieving items as they are needed. Prevent workplace accidents with new warehouse racks in your St. Louis facility. Give productivity a boost with fully customized rack features in your warehouse. If you want to see the productivity in your warehouse rise, consider installing customized racks in your facility that are designed to house the merchandise and products that your employees consistently handle. For example, racks can be outfitted with integrated bins and drawers for the storage of smaller goods or created with deep set decks to properly hold large loads of palletized merchandise without an employee having to struggle to make things fit securely. At the end of the day, simply improving the rack systems inside of your warehouse facility can completely change how well your business operates as a whole. If you would like to know more about warehouse racks for your place of business, reach out to us at Benco Industrial Equipment.